European auto major Groupe PSA on Wednesday reentered the Indian market with the launch of Citroen brand. The company showcased the first vehicle Citroen C5 Aircross, from Citroen family, in Chennai. The company also said it will launch one product every year from 2021. This is the PSA Groupe's second innings in India. PSA which sells three brands -- Peugeot, Citroen and DS -- had a partnership with the erstwhile Premier family resulting in the joint venture Peugeot PAL India. However, it pulled out in 2001. The India project was announced as part of the 'Push to Pass' plan and launched at the beginning of 2017 with the signing of two joint venture agreements with the CK Birla Group. 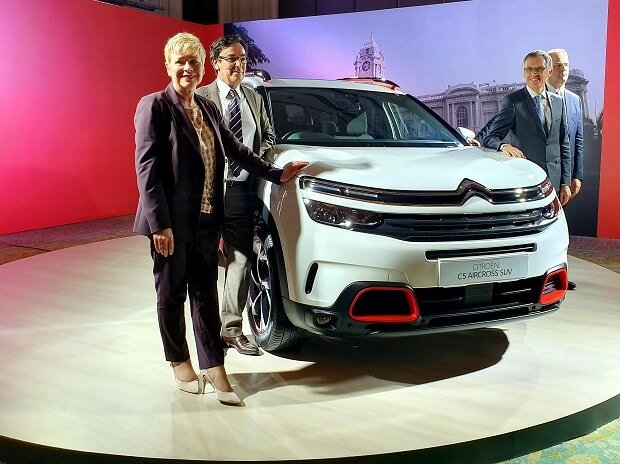 "Announcement of Citroen brand for our Vehicle JV in India, soon after the inauguration of the Powertrain JV greenfield facility at Hosur in late 2018, is a major milestone for the long term partnership of PSA Groupe & CK Birla Group," said the company. The Group’s aim is to “be Indian in India”, to manufacture vehicles and powertrains in Tamil Nadu. In late 2018, Groupe PSA and CK Birla Group had inaugurated the powertrain JV greenfield facility at Hosur. Cars will be manufactured at company's Tiruvallur facility. With Rs 600 crore the factory is geared up to produce 50,000 units in the first year, catering to domestic and exports. The project means to be fully integrated in India with a comprehensive eco-system including local production of vehicles and powertrains, distribution of vehicles and services as well as procurements for the whole Group. Citroën brand, whose history goes back to 1919, range meets future industry norms and customers’ expectations. The first vehicle is expected before end of 2021 after launch of production of powertrain. Citroen C5 Aircross, which was showcased on Wednesday, will challenge the likes of Mahindra XUV500, Tata Harrier, Hyundai Tuscon, Jeep Compass and the upcoming MG Hector. The first Citroen product will be launched here in India by 2020. Company says around 1.04 million Citroen had sold across 90 markets worldwide in 2018.